For the past three years, pretty much since we got our e-bikes, we’ve been saying, ‘we must ride the towpath along the Mayenne’. Well, we’ve finally done it – and we should have done it long ago. It’s the best voie verte we’ve ever cycled. The Mayenne is a wide, lazy river. But there wasn’t much of it. This region has had record-low rainfall this year and all the streams are rivers are vanishing. But we’ve never seen the Mayenne this bad. Some 78 communes in the department currently have water restrictions. The section that joins the town of Mayenne to the larger town of Laval (both in the Mayenne département of the Pays de la Loire) is around 35km long. And for pretty much all of that there’s an old towpath that’s been converted into a voie verte. This is a section of the Vélo Francette cycle route that runs 650km or so from Ouistreham and Caen down to La Rochelle. Looking at the route on a map and Google Earth we thought it would be quite dull – running alongside roads at times and otherwise probably just wending its way among crop and pasture fields. There’s a lot of relatively flat agricultural land around Mayenne. But we couldn’t have been more wrong. Yes, the greenway parallels roads in places – but those roads are high above the river and out of sight. In fact, the river spends a lot of its time in a valley, in places cut through granite escarpments. We were reconnoitring the route with a view to riding it with our dog. Some voies vertes can be a problem if they are intersected by too many roads because it means stopping with the dog and walking him carefully across. Or if there’s a busy road near the greenway there’s a danger of him running into trouble. In fact, we cycled 10km before encountering anything that would pose a problem for the beast. So, there and back, that would allow us to run him for 20km, which is about right. 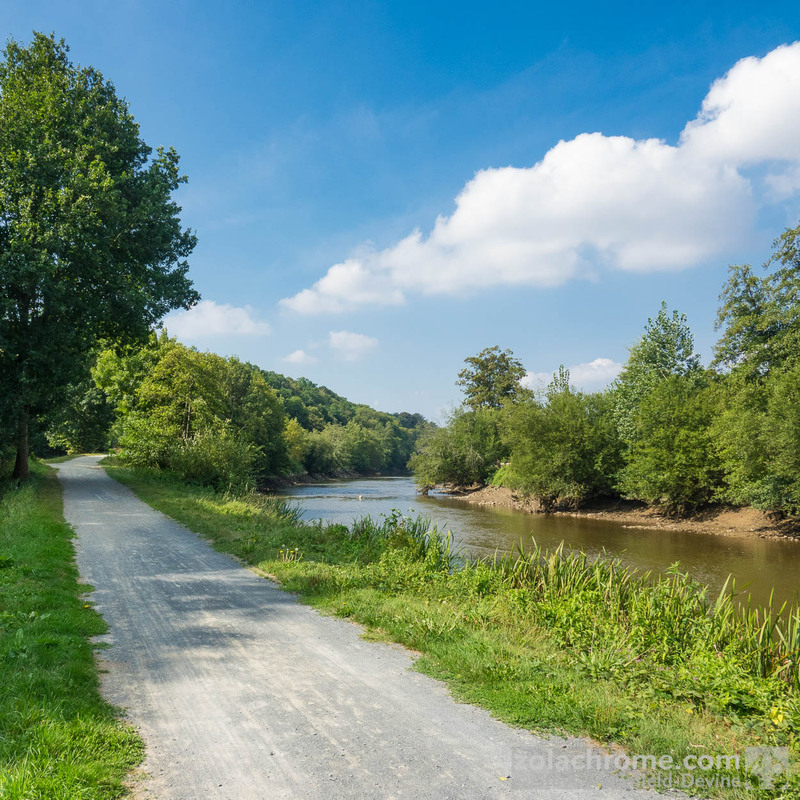 The towpath exists because the Mayenne is navigable and was a major transport route between towns. Canalisation of the river began in the 16th Century. At regular intervals there are weirs accompanied by locks for boats (the Mayenne has a total of 37 locks). Between each weir and lock is a sluice gate for controlling the water level in each section. And, it turns out, in many cases this gate also holds a small electricity-generating turbine. In the sluice gate section on the right is a small power generator. This was the only full section of the river, where water was flowing over the weir – probably because a nearby factory needs the water. There are 24 turbines along the length of the Mayenne, some dating back to 1959. A bunch of them, capable of producing a total of 2,770kW, were modernised relatively recently (one in 2007, another in 2008 and then the rest in 2013-2015). At a couple of the locks are old, ruined mills, the lower sections of which have been modified to house the transformers for the hydro-electric power system. There were many outhouses, too, just begging to be restored to something beautiful. In one section that cut through granite banks were tracks running up the hill, deeply buried in woodland and often cutting straight through rocky outcrops. There was something ancient-looking about this landscape, even though the lack of overgrowth suggests these tracks are in regular use. There was also a cottage so derelict I almost missed it. There was a boat that had seen better days, too. Some houses, though, were in notably better condition. We’ve decided this is going to be our next home. The variety of scenery was stunning – from wide, open, gently sloped river valley to snug, wooded paths cutting through trees. We stopped for a picnic lunch at a point where the track runs under granite outcrops. Luckily, I didn’t notice how precarious the boulders above our heads looked until we were about to set off again. In the end, we rode 15km of the track before heading back. It was one of the most beautiful rides we’ve ever done. And it starts a 30min drive from home. So, having waited so long to ride it, we’ll be coming back often. Hopefully, there’ll be more river in the river next time. Thank you! This little read and photos made me feel like I just had a mini vacation. Something I needed today after a busy, emotional weekend with a Funeral/memorial service for a dear friend and then a beautiful wedding of my niece. These were at either end of the state of Indiana and now I’m just tired of driving and being around too many people. Thanks again! Thanks Janet – glad you got so much from it! I first came to your blog when looking at reviews of Brooks saddles (I am now the proud owner of a B67 and very pleased with it) and then signed up to follow you. I do this quite often when something on a blog has proved interesting or useful, but then often find that I don’t enjoy future posts, especially when the blogger lives abroad. But I have really enjoyed reading this post – I am very much a UK cyclist but you really made me want to cycle this path!! I love your photos – I know that I too would have loved looking at those old lock keepers’ houses and the cottage in the woods.